As sure as growth slides and employment numbers tumble, so cases of fraud rise during recessions. This time is no different. 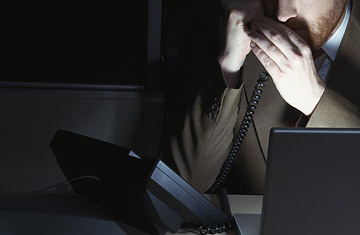 According to a report out May 20 from the Network, a U.S. firm that runs compliance and corporate-governance hotlines for about half the Fortune 500, fraud-related calls amounted to 21% of all reports in the first quarter of this year, up from 14% in the same period in 2007. While reports of problems such as harassment, discrimination or health and safety transgressions saw "no appreciable increase," according to Luis Ramos, CEO of the Network, the number of whistle-blowers reporting fraud, theft or the misuse of company assets is "going up dramatically." One of the reasons for this trend is that middle management, often a company's eyes and ears for detecting illicit activity, regularly bears the brunt of redundancies during a slowdown. "When that layer's removed, you've eroded your internal processes which are there to control fraud or misconduct," says Hitesh Patel, fraud-investigation partner at KPMG in London. A key factor in fraud cases during Britain's last recession, in the early 1990s, it amounts to a "change to business strategy, without a change to the business process," says Patel. But there's another reason for the surge in cases of deceit. Far from simply fueling fraud, there's nothing like a nasty bout of recession to flush swindlers out. By digging into their own operations amid the financial squeeze, firms are unearthing historical deception. In 2008, U.K. courts tried individuals for the fraudulent loss of some $450 million at the public and private organizations affected, according to KPMG, three times the amount in 2007. While some of that increase can be put down to wrongdoing prompted by the financial crisis, ongoing fraud uncovered as a result of the recession also played its part. "Companies are restructuring, revising their strategies, trying to preserve their interest, their cash, their asset position," says Patel. "And because of looking at their businesses, they're starting to find more fraud." So, too, are company liquidators. With insolvencies among U.K. companies rising amid the downturn, disqualification proceedings against the firms' directors for fraud or theft rose 72% in the year to April, according to figures compiled by London law firm Wedlake Bell. And as the recession tightens, employees nervous about their own positions have found themselves blowing the whistle on others. Helping drive up fraud-related calls to the Network, "employees are saying, 'Hey, I'm not going to look the other way', because if my company can't make its earnings or can't safeguard its assets, then my job might be lost," says Ramos. With analysts forecasting plenty more fraud as a result of the global slowdown, whistle-blowers may have their work cut out for them. See the 25 people to blame for the financial crisis.